Joomla is one of the content management systems, and is well comparable and competing with the WordPress and Blogger blogging platforms, which are in the top of the league while Joomla has got in itself a lot other to talk about. While there are thousands of web hosting service providers on the web, there is always a specific hosting option many provide, and we have seen the top hosting companies providing dedicated plans for users who want to host only the Joomla, WordPress or E-commerce based websites and blogs, and they didn’t want to rely on the general Windows or Linux hosting for the same. Joomla Hosting is one such hosting option where in particular only the Joomla based websites can be hosted, and the specifications in these packages suit well with the requirements of the Joomla CMS. There are several big hosts providing some great hosting packages for the Joomla websites, and to select the best in them is again a hard task when you haven’t done any research or do not have much time to check which would be the best in the huge list. 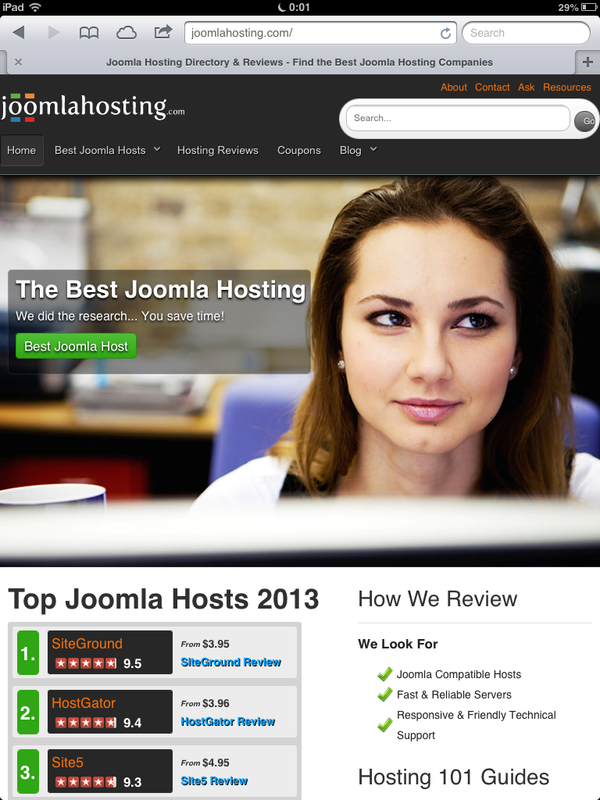 One of the best resources that would do the job easier for everyone, is JoomlaHosting.com which reviews, rates and suggests the best web hosting companies for hosting the Joomla based websites. This website has been there since a long time, but now there is an upgrade where the responsive theme applied to it has made it look different on every platform – Desktop, Tablet devices and Smartphones and thus it is easier to navigate and read the reviews of the various Joomla Hosts from the different devices and platforms. Let’s talk about the Design initially! Design wise, JoomlaHosting.com has been made very much easier to navigate, with the dropdown options list and the direct-access links to the reviews of the best hosting companies, and you don’t need to open each of the page to see the average rating, as on the home page itself there are ratings given for each company, with the minimum pricing quoted by the providers. Apart from these, we could see the way how the reviews are done by the team, and the several guides and blog entries, making it easier for a webmaster or a blogger to understand and select from one of the best Joomla hosting providers. Rendering on the iPad and Tablet Devices – The responsive theme now makes it totally adjusted on the tablet devices, and although the website on the web browser looks so large, in the browser of the Apple iPad or any tablet device, would fit itself and make it easier to navigate. Going internally into the pages, one would be able to see what the website actually provides. 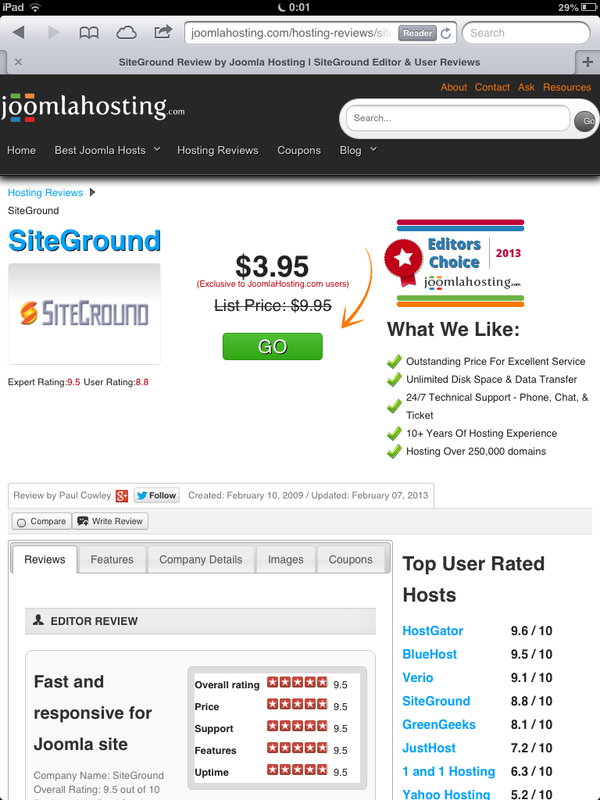 The review pages, for example, the SiteGround Review page lists quite a lot of information, and that is where one can easily decide whether they can trust the host and opt for them, because things are listed in such a way – Pricing, Expert Rating and User Rating, Review, Features, Details of the Company and the comparison to the ratings of the other Top User Rated Hosts – All these in a single page would make it all easy to judge and come to a final decision. Price – Pricing although given by the top companies is competitive, it is a factor that every user checks twice, given the budget in mind. Support – Customer support is what would keep the customer stick to the same host for a longer time, with the all-time service and answering to every query of the customer. Features – There are several features, add-ons and stuff that are provided by the hosts, and with the competition, it is important to check which one gives better features than the others. Uptime – It’s necessary to have the website up for most of the time, and rating the host based on that factor is pretty important. Apart from the above ratings, there are certain factors which the website lists as the best points that they liked about that particular host, like the Pricing, disk space and bandwidth limits, support, experience and the portfolio. The section below the main review by the Editor is filled by the several reviews from the actual users, who have listed the pros and cons of the particular host and this would make it easier to understand how the companies fare when actually dealing with the real customers. The page we were on, the company had received the Editors Choice award for this year, and this is not just a blind assessment and awarding, as there are many factors taken into mind before selecting the final winner. The website earlier had just the simple ratings and review with a few user ratings, but now the enhanced pages have got the opinions from the editors, and there is no bias as there are real user reviews and ratings which can make the decision making a lot better, while there are not many good hosts to choose from, thus the confusion is lessened and there are the best suggestions from the editor. Head on to JoomlaHosting.com and see how easy it has got to choose the best web host for hosting a Joomla website based on one’s own requirement. Note: This is a review done by The WWW Blog, for JoomlaHosting which is a website handled by Paul Cowley and we aren’t being paid to write everything positive. This is a non-biased review of the website.